Egg carton or something to hold ornaments upside down to allow the excess paint to drip out. 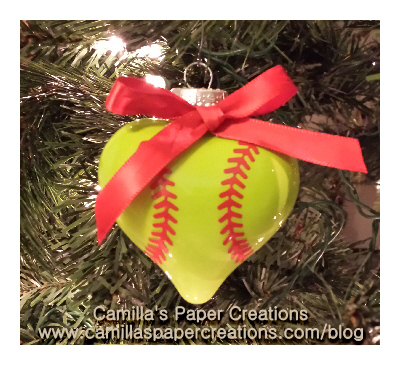 Softball Stitch cutting file from Camilla’s Paper Creations – for heart ornament use 2 piece softball stitching. 1. Carefully remove the metal hangers from the glass bulb. Set aside, out of the way as these will not be needed again until project is complete. 2. Pour about 1 teaspoon rubbing alcohol in each bulb. 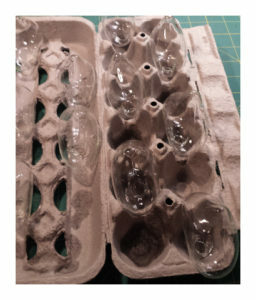 Shake to remove any debris from the bulb, empty and tip upside down in the egg carton to allow to air dry. Make sure the bulb is dry completely before filling will paint. 3. 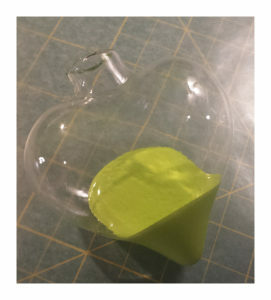 Once dry, pour paint inside the bulb. Roll the bulb and let paint inside run to coat the inside of the bulb. If you are impatient, like me, you can vigorously shake the bulb…if this is your approach, please use a lot of caution. • Don’t let the bulb hit anything as it will break. • Even with the hole covered with your finger paint still does escape and can be propelled across the room. • Be very careful using your finger to cover the hole on the bulb as most of the time there are little sharp pieces that can stick into your finger. 4. 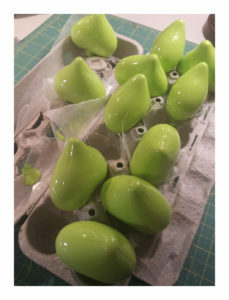 Once the inside is coated, tip upside down in an egg carton and let the excess paint drip out. 5. 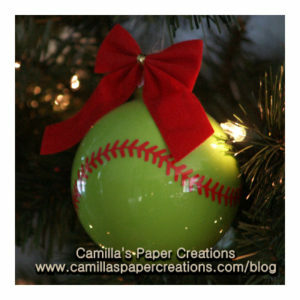 Apply red vinyl softball stitching to the outside of the glass bulb. 6. Carefully replace the cap of the ornament. They can scratch the inside of the bulb and paint if not careful. 7. Every softball player loves her bow…add a bow to the top. I typically tie a bow and insert a lightweight wire in the knot and add to the bow.